Don't let this one slip away! Specially designed for the adult collector. Don't let this one slip away! Specially designed for the adult collector. Johnny Lightning 1967 PONTIAC GTO from. YOUR LOOKING AT A 1983 CHEVY MONTE CARLO. THIS CAR HAS NICE DETAIL FOR ITS SIZE AND HAS RUBBER TIRES. Johnny Lightning 1957 CHEVY BEL AIR CONVERTIBLE from. Don't let this one slip away! Bonus Photo Card! Specially designed for the adult collector. Don't let this one slip away! Specially designed for the adult collector. Johnny L ightning 1 965 PONTIAC CATALINA 2 2 #6 B Blue from. Don't let this one slip away! Specially designed for the adult collector. Johnny L ightning 1 965 PONTIAC CATALINA 2 2 #6 A from. Don't let this one slip away! 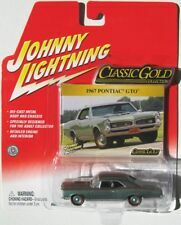 Johnny Lightning 1967 OLDS CUTLASS 442 from. Johnny Lightning 1958 CHEVY CORVETTE from. hard tires. Don't let this one slip away! Specially designed for the adult collector. 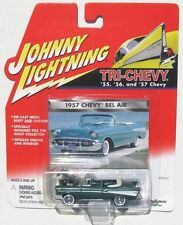 Johnny Lightning 1957 CHEVY CORRVETTE #28 from. Don't let this one slip away! Johnny L ightning 1969 AMC AMX from. Plus a Bonus Photo Card. Don't let this one slip away! Specially designed for the adult collector. Scale 1:64 Item No.404-07 VHTF Released in 2000. OUT OF PRODUCTION! Johnny L ightning 1958 CHEVY IMPALA from. Don't let this one slip away! Specially designed for the adult collector. Plus a Bonus Photo Card. Don't let this one slip away! Specially designed for the adult collector. 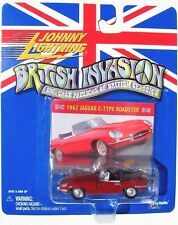 Johnny Lightning 19 79 CORVETTE Rubber Tires from. 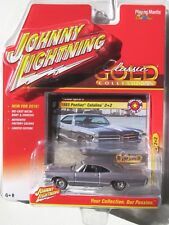 Johnny Lightning 1957 STUDEBAKER GOLDEN HAWK #4 from. Don't let this one slip away! Specially designed for the adult collector. YOUR LOOKING AT A 1958 CHEVY CORVETTE. THIS CAR HAS VERY NICE DETAIL FOR ITS SIZE. THE HOOD OPENS TO SHOW OFF THE DETAILED ENGINE AND HAS RUBBER TIRES. YOUR LOOKING AT A 1958 CORVETTE CONVERTIBLE. THIS CAR HAS VERY NICE DETAIL FOR ITS SIZE. THE HOOD OPENS TO SHOW OFF THE DETAILED ENGINE AND HAS RUBBER TIRES. 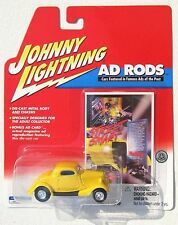 JL Hot Rod Magazine R4 This diecast vehicle has authentic detailed black interior, blue exterior, white st ripes, real wheels series rubber tires,gold and silver rims, black painted base. Don't let this one slip away! YOUR LOOKING AT A 1964 CHEVY PICK UP. THIS PICK UP HAS NICE DETAIL FOR ITS SIZE. THE HOOD OPENS AND HAS RUBBER TIRES. THIS IS THE 1970 PLYMOUTH SUPERBIRD ADULT COLLECTIBLE 1/64 RUBBER TIRES THAT IS LOOSE AND IN GREAT SHAPE. DETAIL IS AWESOME. VIEW PIC. SHIPPING AND HANDLING INFO LISTED. THANKS FOR VISITING OUR STORE AND FEEL FREE TO EMAIL WITH ANY QUESTIONS. THANKS AGAIN AND HAVE A NICE DAY! Don't let this one slip away! Bonus Photo Card! Specially designed for the adult collector. Johnny Lightning 1955 CHEVY BEL AIR CONVERTIBLE from. YOUR LOOKING AT A 1969 IMPALA SS CONVERTIBLE. THIS CAR HAS VERY NICE DETAIL FOR ITS SIZE. THE HOOD OPENS TO SHOW OFF THE DETAILED ENGINE AND HAS RUBBER TIRES. Johnny Lightning. COM RACER Y2K BUS Rubber Tires. Don't let this one slip away! Specially designed for the adult collector. VERSION WAS A CHASE CAR THAT WAS RANDOMLY INSERTED INTO THE FINAL PRODUCTION LOTS SIMILAR TO THE HOT WHEELS TREASURE HUNT CARS. MOST OF THESE HAD THE PLASTIC TIRES. THE REAL RUBBER TIRE. THIS IS THE HARDER TO FIND CHASE CAR RUBBER TIRE VERSION! JOHNNY LIGHTNING. COM RACER Y2K VOLKSWAGON BUS Rubber Tires. International orders usually arrive within 2-3 weeks however delays can occur (although rare).